The innovative flexJET project is diversifying the feedstock for sustainable aviation fuel (SAF) beyond vegetable oils and fats to biocrude oil produced from a wide range of organic waste. The process offers better economics and improved overall sustainability by processing waste feedstocks near the source and at a scale that matches the waste availability. This is the first technology ever to use green hydrogen from waste feedstock for refining thereby maximising greenhouse gas savings. This project provides clear technical and economic validation, by building a demonstration plant at pre-commercial scale to deliver high quality SAF. The flexJET project is delivering a blueprint for the production and distribution of this novel SAF technology. This will be a showcase of the medium to long-term impact on the aviation industry in Europe and beyond. The flexJET process is highly scalable and less capital-intensive than current technologies and can be integrated into existing infrastructure. 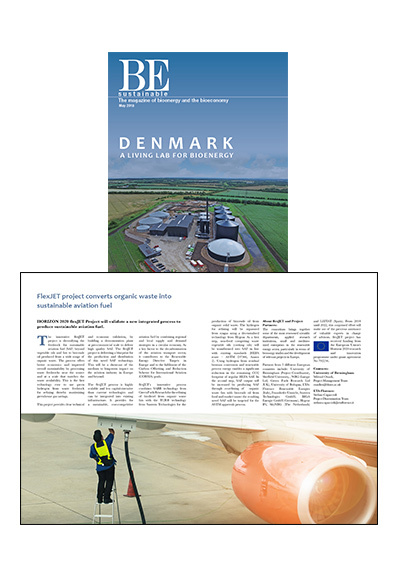 It provides for a sustainable, cost-competitive aviation fuel by combining regional and local supply and demand strategies in a circular economy. As a key factor to the decarbonisation of the aviation transport sector, it contributes to the Renewable Energy Directive Targets in Europe and to the fulfilment of the Carbon Offsetting and Reduction Scheme for International Aviation (CORSIA) goals. flexJET’s innovative process combines SABR technology from Green Fuels Research for the refining of biodiesel from organic waste fats with the TCR® technology from Susteen Technologies for the production of biocrude oil from organic solid waste. The hydrogen for refining will be separated from syngas using a decentralised technology from Hygear. As a first step, non-food competing waste vegetable oils (cooking oils) will be transformed into SAF in line with existing standards (HEFA route – ASTM D7566, Annex 2). Using hydrogen from residual biomass conversion and renewable process energy enables a significant reduction in the remaining CO2 footprint of regular HEFA SAF. In the second step, SAF output will be increased by producing SAF through co-refining of organic waste fats with biocrude oil from food and market waste: the resulting novel SAF will be targeted for the ASTM approvals process. The consortium brings together some of the most renowned scientific departments, applied research institutions, small and medium-sized enterprises in the renewable energy sector, particularly in terms of bioenergy studies and the development of relevant projects in Europe. Partners from 5 different European countries include: University of Birmingham (Project Coordinator), Sheffield University, , WRG Europe Ltd, Green Fuels Research Ltd (UK), University of Bologna, ETA-Florence Renewable Energies (Italy), Fraunhofer Umsicht, Susteen Technologies GmbH, BIGA Energie GmbH (Germany), Hygear BV, SkyNRG (The Netherlands) and LEITAT (Spain). From 2018 until 2022, this conjoined effort will make use of the precious assistance of valuable experts in charge of advisors. flexJET project has received funding from the European Union’s Horizon 2020 research and innovation programme under grant agreement No 792216. This project has received funding from the European Union’s Horizon 2020 research and innovation programme under grant agreement No 792216.